Raise your hand if you knew that Jesse Owens wasn’t the only black athlete at the 1936 Olympics. Deborah Riley Draper is not ashamed to admit that there was a time she didn’t know, either. It’s precisely why she made her stunning documentary Olympic Pride, American Prejudice. There were 17 other black Olympians with Owens, many of whom won medals. 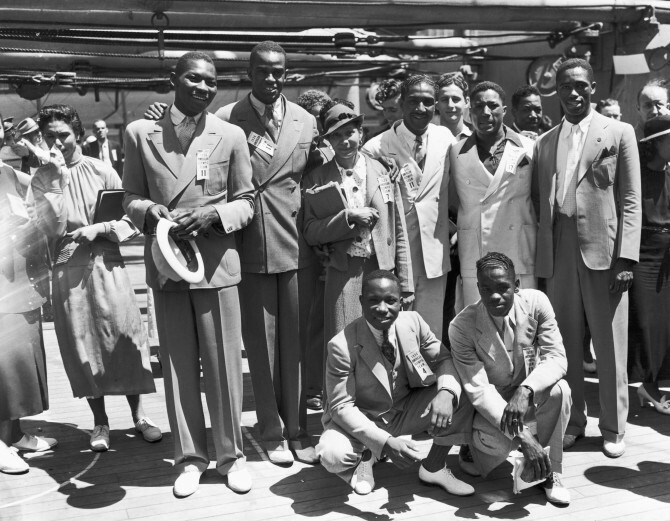 Their names are Ralph Metcalfe (4×100-meter relay, gold; 100-meter dash, silver); Jackie Robinson’s older brother, Mack Robinson (200-meter dash, silver); Cornelius Johnson (high jump, gold); Dave Albritton (high jump, silver); James LuValle (400-meter run, bronze); John Woodruff (800-meter run, gold); Archie Williams (400-meter run, gold); Frederick “Fritz” Pollard Jr. (100-meter hurdles, bronze); John Brooks (broad jump); Jack Wilson (bantamweight boxing, silver); Art Oliver (heavyweight boxing); Howell King (heavyweight boxing); Willis Johnson (heavyweight boxing); James Clark Atkinson (middleweight boxing); John Terry (weightlifting); Tidye Pickett (women’s track and field); and Louise Stokes (women’s track and field). They hailed from various parts of the country, from Pasadena, Calif., to Chicago; from Massachusetts to North Dakota. Draper, a former advertising executive who burst onto the scene in 2012 with the acclaimed black-model-focused Versailles ’73: American Runway Revolution, found these men and women accidentally while contemplating another project. Draper believed “the fact that they were present and accounted for, [along with] their presence on the medal stand, sent a message on both sides of the Atlantic.” Eighty years later, Owens’ solo accomplishments still wowed enough to warrant a big-screen film. So why wouldn’t the story of all 18 black Olympians be even more awesome, especially given the era? Assembling this story wasn’t as easy as one might assume. Draper encountered a lot of unexpected obstacles. Official Olympic pictures were often wrongly captioned, with the subjects, even those with medals, misidentified. “We had pictures, so we had faces with no names,” she recalls. To put the pieces of the puzzle together, the Atlanta-based filmmaker and her team turned to a variety of sources, including such leading black newspapers of the day as the Chicago Defender, Pittsburgh Courier and Baltimore Afro-American. Much later, stories in Ebony, as well as obituaries, also helped. Draper, herself, even made an emotional journey to Berlin. Olympic Pride features an enlightening, subtitled interview with a German spectator from the 1936 Olympics. In all, it took four years to complete. The result, like Versailles ’73, which Draper also directed through her production company, Coffee Bluff Pictures, is astounding. Although Blair Underwood, who does double duty as an executive producer, officially narratesOlympic Pride, the voices of some of the actual Olympians can be heard as well. In fact, their voices take over much of the documentary. Some of their voices can be heard through their children, even if it is heartbreak that sadly shines through the most. Having these great accomplishments ignored or, worse yet, negated by racism was too painful for many of the Olympians to relive. So much so that some of their children were unaware of the magnitude of their parents’ accomplishments until Draper came calling.